Acting Prime Minister Winston Peters says there is simply no money left for the Government to offer nurses. But he is holding out hope industrial action, which the NZ Nursing Union (NZNO) this morning said would be going ahead on Thursday, can be avoided. The 24-hour strike will be the first industrial action by nurses in 30 years. Speaking to media in the Beehive this morning, Peters said the Government is “very, very disappointed” with the Union’s decision. He says in addition to the offer of a pay increase, in the form of two extra steps in their pay scale, the offer the Government put on the table sought to address staffing issues by adding 500 extra nurses. Peters says the Government won’t be going back to the NZNO with a higher offer – “this is our best offer… this is the best we can do,” he told reporters. Asked why the Government can’t just use money from its surplus, Peters said the surplus can be “so easily eroded” pointing to $800 million the Government is spending to eradicate Mycoplasma Bovis as an example. He says earmarking any money in next year's Budget for nurses pay will depend on the state of the books next year. According to Treasury projections from the Budget, GDP growth is forecast to average 3% per year until 2022. Healthy Government surpluses are also expected over that period. NZNO Industrial Services Manager Cee Payne said 30,000 members would be involved in the strike, although some would work to ensure life-preserving services continued. Peters says there is still time to avoid industrial action with an 11th-hour reconciliation, and talks will continue with the NZNO over the next two days. Peters blamed the previous Government, saying it had underfunded the nurses for nine years. Would a member of the public who is suffering thru having an appointment cancelled or date changed be within their rights to launch a law suit against the nurses union for anguish and pain? Why are people striking? it's because the previous government has flooded the country with astronomical housing debt which means that the landlords are close to being broke as are the tenants.. I always thought that the Aussie's were a stupid breed... (Criminals that were dumb enough to get caught and sentenced - the best criminals remained in the UK (too smart to get caught).... However it appears that the Aussie crims became banksters and they have well and truly rorted NZ's very honest and sometimes overly naïve citizens. This is a common perspective of many, but shows short sightedness and selfishness. Here's an observation based on experience - I have a military background and about 10 years ago worked at a senior level in a DHB, and am now in another Govt Dept. I have also worked in a private, commercial company. I suggest that under the free market economy, but also perhaps beginning before, there has been a degree of elitism (and possibly class) enter into the wage system. In DHBs I have observed the Doctors union squeeze the system very hard for money, this has resulted in usually very little left over for others working in the DHBs, particularly nurses. But I also noted that anyone in a management role, including myself, was paid very, very well, and at a level that did not reasonably compare with what other comparable roles received. As to Doctors, i noted that Doctors fresh out of university started on about $80K, a ridiculous amount considering the level of supervision they required, and comparable rates for other new graduates. Doctors told their patients that it was the DHBs faults that they weren't being seen when they went on strike for money, and the DHBs were very sensitive to adverse publicity, and did not fight back well, if at all. Nurses on the other hand said their patients were more important and tried to be reasonable in wage negotiations, thus 30 years of not striking, accumulated decline in wages and now this. In other industries, including government, managers are well looked after, but they also work to undermine their workers negotiating power, by pushing for IEAs and if you push too hard, there is always someone else lining up to take your job. Agreed. There's plenty of money sloshing around the DHBs for the nurses, but the way it's distributed needs an overhaul. From the perspective of my two sisters who are nurses and my daughter in her first year on the job, undermanned rosters and the resulting over-work/fatigue are a chronic and on-going problem. Not helped at all by the punitive measures imposed when mistakes are made which are supposed to act as a deterrent. Unsurprisingly morale has taken a huge hit, especially over the last decade. Nurses in the public sector are resentful of managers that cherry-pick their best ideas in meetings, then claim the bonuses. They are utterly disdainful of their management in general who they see as parasitic and opportunistic. Even the Unions are falling out of step with the COL, with the new industrial laws we are facing to much power is potentially being given back to the Union movement. ..the surplus can be “so easily eroded”..
Well, trumpeting that there Surplus from every rooftop in the land was something of a GiveAway, no? Still, glass half full. this list is gonna keep the Coalition spinning for its life. And while they are doing That, there is marginally less chance that they can devote energies to foobarring the real economic life of our Fair Country. Any advance on Stephen Joyce's black hole estimate of $11 billion - I have a bid form the back of the room for $15 Billion - aye a telephone bid for $20 Billion - passed in for negotiation. Finally sold for $25 Billion to that brilliant economist (R Sole) add the name of your favourite COLL Poly or Bank/Union Economist. The inevitable catch-up... to pay for housing costs that have inflated grossly whilst incomes stagnated. Nurses are loved and government paid, spare a thought for all the people who are unable to walk off the job. The best solution is to halve housing costs.. such an unproductive waste of money. Is it really the housing issue or nurses just want more so they don't have to move to usa and australia? Its only Auckland where house prices are higher so why pay all nurses the same rate as someone who works in Auckland? Would you expect a higher population with a large amount of housing options to need more nurses and thus have more nursing jobs available? Yet the rates for rental housing across the country are rather similar with the housing crisis. It is not exactly as if 1000 of them could move to Blenheim or Northland overnight and work there (the housing & job competition is even more limited than Auckland). They all have difficulty with finding work where they can live, with most across the country having issues with housing costs. If they however mostly owned housing then wage & living cost differences might come more into play. I am in support of reasonable pay increases to nurses and teachers, but what makes clerical and admin workers in the public sector think they are more valuable to the economy than their private sector counterparts. Threaten to strike and then do what? Walk away? Sure. Unless these workers have been writing codes, creating policies or managing finances for the government, they aren’t worth a dime more than the private workers. Nobody should expect 80k a year of taxpayer money in a low wage economy for answering phone calls, making coffee and pushing paper around all day. Harsh. As well as answering phone calls, making coffee and pushing paper around all day, these good folks are contributing to union coffers, thence to the re-election of their Labour lords and masters, and thus to the Greater Good! Pity the CoL flushed all that money down the toilet on Shane's bribe fund, Winston's big embassy spend up and Middle class bribes (Free student fees, Winter Fuel Payments). They had so much wiggle room having inherited a strong economy with ongoing surpluses and good growth, and they blew it all on booze and trinkets in the first 6 months. Gonna be a bleak couple of years. I'm ok with that as long as those that voted for this lot own the outcome. Hahaha. This is the 21st century, it is always someone elses fault. Even the Granny Herald was highlighting economic slowdown as something the next government would have to face. Moreover, the dichotomoy of either less indebting of students or paying nurses reasonably should be extended more widely. For example, too many are in favour of paying an unneeded welfare benefit to old rich folk rather than paying nurses fairly, or rather than allowing young people to enter the workforce with a bit less debt. Because those folk would rather not stand on their own two feet. Go for it nurses, Police all govt depts. we all want big pay rises -remember Labour are the gods that fix everything , the Labour party brought this on themselves , PLENTY OF MONEY FOR PLANES and Winston First Party , as soon as this government is gone the better. How will it all be paid for? increase in prices/taxes across the board. Result - everyone needs a payrise. You have seen nothing yet..
Back to basics and rubbish so called "unaffordability"
A country, or organisation, or ministry only has X amount for its wage salary bill..
For long term social stability/ growth, requires that 50% of the middle 'class' (for want of a better word) earn 50% of that pool. The basic bell graph. It is this 50% that are the buying power, houses, goods, services, and leisure. Reduce the 50% of the national wage/ salary take in this group we end up with an economy and social structure that has to be patched for growth.. IE population growth/immigration to maintain growth. Extend this 'clatons' economic growth out and we end up with other patches like tax everyone to subsidise the lower end of the 50% so they can pay rent, pay bills. This is the core part of our society and economy that should be able to afford homes, goods. If one expolates out this trend even further we will sethings head back to a serfdom/ slave type sociatry where a very small (top 25% or less of the bell graph gobbling up most of the allowable total wage salary pool. We have come a long way since the serfdom days.. so it seems, but well on the way back. Only this time, and there have been signs for several decades the middle 50% of the bell graph have been getting restless.. The clark home rent subsidy being a symptom of things going wrong...and a pacifier to hold the lid down. It is an income issue where those who are meant to grow the economy no longer have the income to do so. 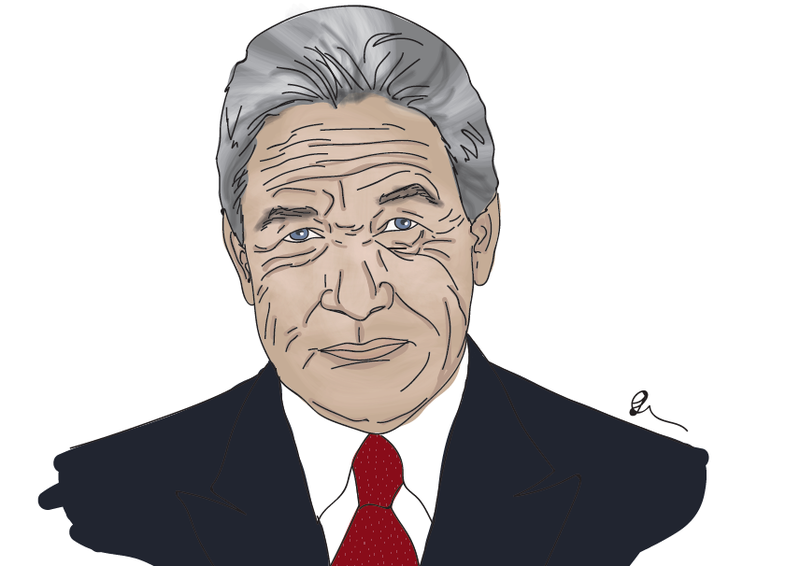 "Acting Prime Minister Winston Peters says there is simply no money left for the Government to offer nurses." What a load of rubbish.. reduce the top 25% of the bell tower income back to 25%, and the money appears. Cant be done over night. If it doesnt happen, we think the 50s stikes where bad, or the late 60s / 70s rough.. we havnt seen anything yet. We can avoid much of this.. its not rocket science. Playing with min wage, and living wage is just political head in the sand propaganda.. the argument for and against are both right because it is not the soln or part of it. Unaffordability (another popular political propaganda term), is not about prices to high but , those who should be able to afford no longer have the income to buy. Economic growth based on population growth, stable social structure, so called child poverty debate, all come back to the loss of the middle 50% shop keepers, nurses, teachers and candle stick makers no longer get 50% of the total countries wage/ salary bill. David..... What is the proportion of the bell graph now? Top 5% pull 60 plus % of the wage (buying power ) of this country? Good grief. You write a Marxist diatribe and then ask David for facts to back it up. Perhaps people other then media stars, corporate staff and property flippers want a share of the Rock Star economy? Deserving/affordable or not, when rising numbers feel more and more like they are missing out on this 'prosperity' then they will act and vote accordingly. Prepare for a rise of the left. As regards who pays what % of tax, it is now not possible to find that information. Prior to the 2018 Budgets, Treasury published a table "Who pays income tax, and how much". You can find that here for the 2017 Budget (page six), but it was a regular data item going back decades. In 2017, the 11% of taxpayers earning $90,000 pa or more paid 48% of all income tax. In Budget 2018, it has been discontinued. The equivalent document is here. If anyone knows another source for this data, I would be happy to know. I wonder how many of that 11% earning over 90,000 are paid directly by the government or by organisations that rely on government funding, patronage or regulations for their existence. I expect quite a few. Long but good, if you are prepared to persist through the introduction! A nationalised wage structure for nurses is not fair. A nurse in Invercargill and a nurse in Auckland earning the same amount are not in the same economic boat. Same goes for teachers, police etc. Why not pool all of the money available for nurses pay rises and use it to pay a universal accommodation allowance to those living in accommodation supplement housing areas 1 and 2. make it say 300 a week for area 1. $15600 per year will get some support amongst those most affected by housing affordability. A bit of divide and conquer. So you clearly dont live in a small town like Invercargil as if you did you'd know how hard it is to attract and retain medical staff in rural centres. The reality is that if they paid less than city rates in rural areas it would become a larger crisis than it already is. So this story isn't true then'? Wow...it really does not make a lot of demographic sense for Southland house prices to have been going up then. Certainly shows a trend, and that that any person could see where its going...espec non marxest Then throw in history.be it back in days of Magna carter, french revolution , 1800s, 1900s , 1950s or 70s. Actually Im rather right wing, and understand history and how it repeats..especially the , 'living memory ' phenomena. Classic example US protectionism as economic soln in early 1930s, which did not happen would not have thrown the world into a depression...And how Commonwealth/ british empire countries, and a (couple others that also joined in) fended better and recovered 1st... free trade. PS I doubt author of the comment above re "Marxist" has ever read "Das Kapital" and if has wouldn't have made such an uniformed statement...if anything would have read "Mein Kampf".. thu doubt that unlikely as well. Government surpluses drain money from the economy. Storing up "serious reserves for rainy days" is going to cause a recession. If you think govt surpluses drain money from the economy what does paying interest on $60Billion of Govt debt do? Interest paid by the government on government debt is money flowing into the private sector. Which private sector? The one in New Zealand? But it was pulled out of the private sector by taxation in the first place.. and as nzdan implies, some decent chunk of that goes overseas.